Our nostalgia for the 1980s and its various toy lines tends to stay with the stuff that is considered “landmark” or awesome: G.I. Joe, The Transformers, Masters of the Universe, The Thundercats. But for every one of those toy lines, there’s something that never really leaves a mark. 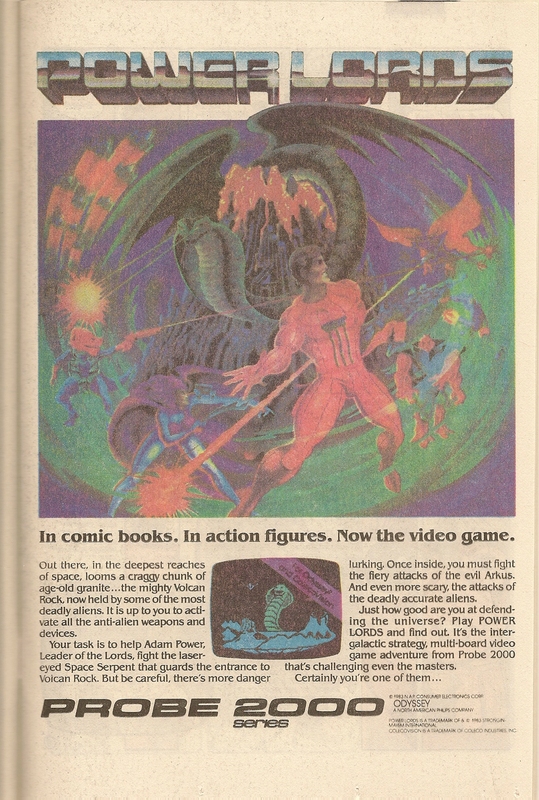 While I was reading an old comic book the other day, I noticed that the back cover had an ad for Power Lords, which Revell released in 1983. Based on the timing and the size of the action figure produced, I think that they were trying to compete with He-Man; and the science fiction back story suggests that perhaps they were also taking a shot at Return of the Jedi, which had come out that May. According to Wikipedia, the people at Revell had hired Wayne Barlowe, the author of a book called Barlowe’s Guide to Extraterrestrials, to help design the toys and probably develop some of the backstory as well. The idea here is that you’ve got a guy named “Adam Power” (Prince Adam, much? ), who is an earthling that is given a power jewel that he can somehow use to become The Power Lord, who is one of a group of heroes trying to save the world from an evil alien dictator named Arkus. Revell may have hired a science fiction writer for this but honestly it sounds like a backstory courtesy of 1980s toy line Mad Libs. Anyway, I never actually owned a Power Lord. When I saw a commercial for them, I … well, I thought they looked really lame. It was kind of like the first time I spotted Megaforce on television: prior to this, I’d take an interest in any toy that came my way but this time around I saw that something could be completely lame. I mean, I’m sure that some of the alien characters were pretty cool to play with, but when your main hero is an unattractive guy with a goober haircut in a bright orange jumpsuit whose other side is a blue alien with a soft rock white guy fro it doesn’t make a six-year-old want to play with your toys. So when Christmas 1983 came around, I opened toys like the Attack Trak, Castle Grayskull, Man-E-Faces, and Panthor; not even a misguided aunt, grandparent, distant second cousin, or family friend who could always be counted upon to give me the most random of random Christmas presents dared buy me a Power Lord even after they were probably relegated to the aisle of forgotten toys or an Odd-Lot store in 1986. I did, however, encounter a Power Lord a couple of years later in the children’s ward of Southside Hospital of all places. When I was in the third grade, I had to have my adenoids removed. This was one of a handful of times I’ve had to have surgery and at that point was the first step into the world of orthodontia. Earlier that year, I had gone to my dentist for a regular check-up and he’d noticed that I had a slight overbite. He sent me to Dr. Staker, an orthodontist whose office was located across the street from the video store, and she determined that I was going to have to get braces and that I had to stop breathing through my mouth when I slept. The mouth breathing, she determined, was because my nasal passages were constantly blocked and if I had both my adenoids and my tonsils removed I would be able to breathe a lot better and wouldn’t have so many sore throats. An ENT confirmed this and we were off. Or so I thought. My pediatrician decided that he was going to pull rank and got into a lengthy argument with my orthodontist and the ENT over what I needed to have as far as surgery was concerned and the compromise was that we’d do the adenoids but I’d retain the tonsils (I still have my tonsils to this day and during college I was convinced that it wasn’t my roommate’s smoking habit and my allergy to cigarette smoke but my never-removed tonsils that were giving me sore throats and had to be removed), and I have to say that I was bummed because I knew one thing about getting your tonsils out and that was that you got ice cream and I wanted my ice cream, dammit! 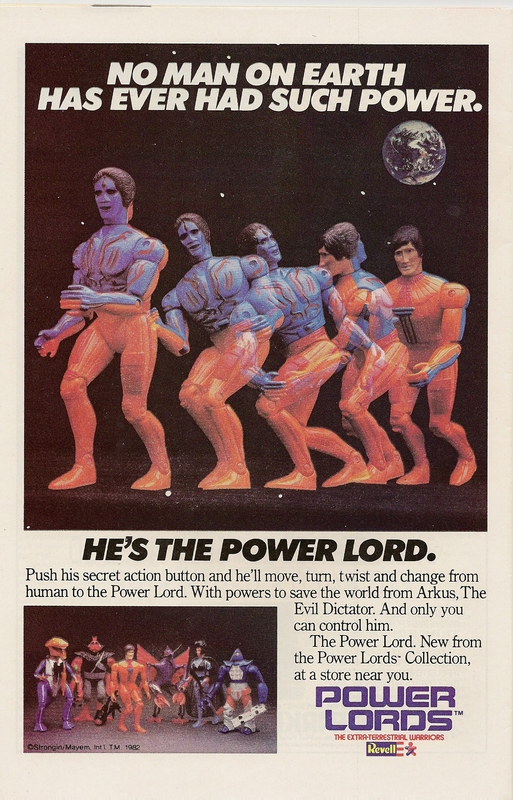 An ad for the Power Lords video game, which I'm sure got lost in the video game crash of 1983. Anyway, I was checked in to Southside (the same hospital where I was born) and admitted to the children’s ward. They had my surgery scheduled for the afternoon, so I was allowed to go to a playroom that they had to hang out since there really wasn’t anything on television and I had very little to do. I don’t remember much about what the ward looked like, except that it reminded me of my nursery school or kindergarten class and I felt that there wasn’t much for a slightly older kid to play with. There was, however, a box of action figures on a shelf and right on top was Adam Power, the Power Lord. I took it out of the box and turned it around to see how he transformed from ’70s space guy to ’80s Blue Man Group member. Then I put it back into the box, mainly because there was nothing else I wanted to really do with it and it smelled like it had been sitting in the bottom of someone else’s toybox since 1983. Yeah, I was weird like that. The Power Lords launch also had a comic book, video game, and other ancillary stuff like puzzles, and I’m sure that it didn’t do very well. 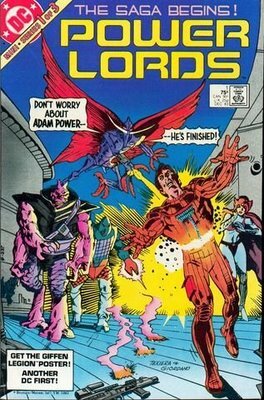 DC put the comic book out and after the three-issue miniseries was over they were never heard from again (honestly, aside from the Super Powers books and its two Star Trek series, DC never really did as well as Marvel did with toy and movie tie-ins). But hey, “No man on Earth has ever had such power.” And nobody never cared so much about it. ← Losers Bizhub, Winners Collate. The Barlowe connection amuses the hell out of me. I’ve got a bunch of his stuff and even tried to get some illustration work from him for a project a few years back (our Marketing Director cheaped-out on me at the last minute). If I’d only known he was the Man Who Created the Power Lords back then, I might have been able to turn the tide!